The Verse’s Jake Francis tells us what he thought about the Phoenix Spotlight event that happened on 10th September 2018. We ask a lot of artists to take part, and many say that ‘I couldn’t possibly talk about my work’. I implore you to have a rethink, its a really useful thing to do. You can communicate great ideas even if you feel inarticulate about the stuff you do. No one wants you to fail. It’s an encouraging environment to express your work. With this much-needed air clear, the anxiety is dulled and we are introduced to our speakers: Tom Heatley and Lucy Brown. Now before we get started, it should go without saying that the upcoming cascade of comments towards each artist is brief with a capital B. My writing skills are hanging by a thread as it is, and nor would I wish to speak for another regarding their inner artistic psyche. So with that in mind, there will be links to each artist’s websites at the bottom of the article. Enjoy! Tom Heatley, perhaps in hesitancy, defines himself as a ‘photographer’. I say this because his practice is clearly much more diverse than he gives himself credit for; a culmination of two-dimensional and three-dimensional forms spliced into a precarious statement of presence and trace. Heatley’s earnest and almost offhand remarks towards his core (and very dense) practice concerns prove that ego is no problem here; he is clearly an individual who loves what he does. And thrives in finding a thread through imagery, symbolism, and blunt realism. It becomes clear soon into the artist’s talk, however, that this has not always been a clean and bump-less road. Heatley recalls sincere instances where tutors liken his meticulous works to mere ‘establishing shots’, and the ever-present gloom of post-university blues; an experience we’ve all suffered. Perhaps the most enticing thing about Heatley’s hybrids of form is their fragility and temporality, or lack thereof. Using the ‘layman’ materials of sellotape, blu tac, and the found object, Heatley questions the very nature of ‘skilled artistic expression’. 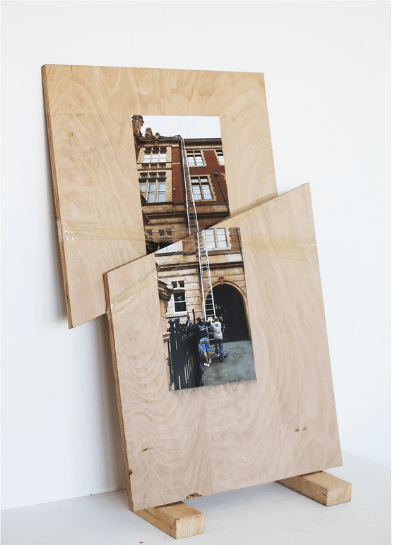 Towing a line similar to the likes of Erwin Wurm or the street photographs of Richard Wentworth, Heatley’s ‘DIY’ projects hinge on the ‘nothing’ and the ‘something’. Although some images are more effective than others (a statement that you could pin on any artist), his marriages of the found and the subtle edit hold a bold charm; it is clear we have an artist here who has very much kept the lego-box open and rustling. Even if the materials have deviated as time has progressed. Lucy Brown’s self-penned lecture title of ‘In Limbo’ is perhaps one of the most fitting labels I have ever seen. Beginning her talk with a trip down a cloth-covered memory lane, Brown clearly cements her sentiment towards the garment in its entirety. A self-confessed hoarder, Brown recalls her all-too-familiar journeys to charity shops, jumble sales, and friend’s attics alike to find her materials; an act that even the most purist of artists would find empathetic. 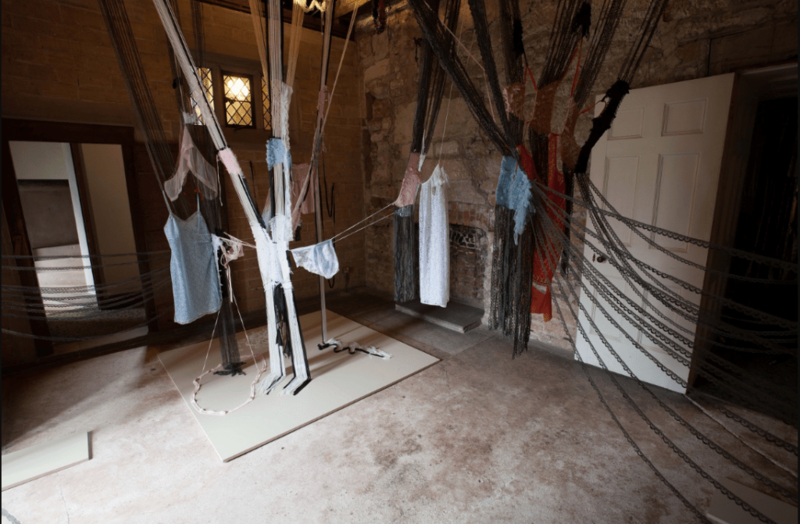 The artist’s use of fabrics, bodily materials, and the worn battle of hard and soft naturally emit a likening to artists such as Louise Bourgeois and Eva Hesse; daunting comparisons, there’s no doubt about it. Brown holds her own in these relations. Impressing the crowd with her prolific career as an installation artist through a multitude of events and commissions. In each, we are treated to images of intricate and chaotic forms. A duality of the intimate and the public literally ‘woven’ as one. The artist’s representations of femininity own a real status of overwhelming intricacy and delicacy; Brown states that she weaves her work ‘in a non-traditional way…everything is cuttable with easy real breaking’. This self-awareness of theme and historical resonance is a breath of fresh air when such heavy subjects are on the table; the artist enriching her own exploits with literature and modern advertising with cynical glee. Brown does not flee from resemblance and the comparative; a trait that is often left by the wayside when topics of gender aesthetics are discussed today. Repeatedly, Brown refers to the deviation and transient nature of the introvert and the extrovert. And how clothing can represent such a flimsy border. The last century has proven that the memento can bridge these concepts in art and life. It is a concept that has defined the generation of artists that we are today, rightly or wrongly. Lucy Brown is clearly a confident architect of such a rigorous and abstract task – and will bring many into its discussions.